Take Advantage of these Prime Planting Conditions! Right now is the best time to plant the best trees of winter! 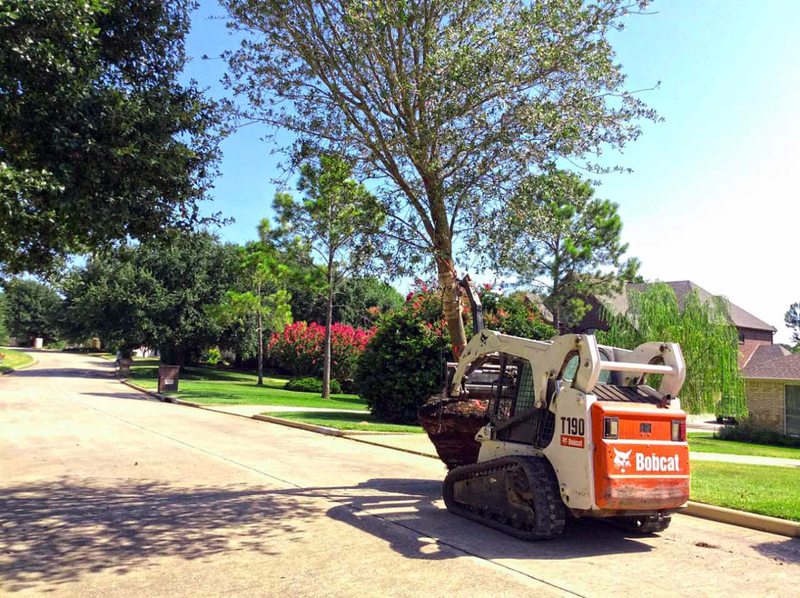 Unlike much of the east coast, we get to experience mild weather, and since our soil does not freeze over, we have ideal conditions for beautifying our landscape with trees! In December, the soil can retain warmth even if the temperature outside starts to drop. And warmer soil is a boon for newly planted trees because it allows them to spend the winter months establishing their root system. We recommend planting all kinds of trees and plants so that you can take advantage of the prime planting conditions this time of the year offers. With that said, we compiled a list of a few of our best trees of winter! Evergreens are the right choice for anyone looking to add a tree that can provide privacy as well as shade, all year long! And though the weather feels comfortable today, once spring and summer arrive and the temperatures start to soar, you’re really going to appreciate those evergreen trees you planted in the winter! Evergreen trees can produce more than their fair share of oxygen to help lower our carbon footprint, and they can be a stylish addition to any landscape. 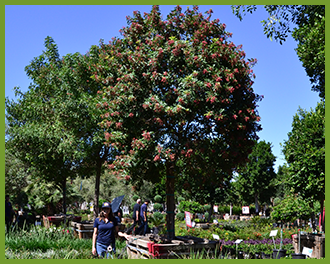 Moon Valley Nurseries has been growing trees for over 20 years with hundreds of varieties for our area to choose from! Here are a few of our best trees of winter that are sure to bring curb appeal! Brazilian Pepper (Schinus terebinthifolius): These evergreens can grow to be medium to large trees with an umbrella-shaped canopy that provides a perfect shady spot in any landscape! These are picturesque trees that bring out the festive mood in the winter when showy bright red berries appear, contrasting beautifully with the dark green foliage. This wintertime bloomer is an excellent tree any time of the year! We have them available in a single trunk or multiple trunk forms so visit your nearest Moon Valley Nurseries location to see these colorful evergreen trees for yourself! Fruitless Olive (Olea europaea ‘Wilsonii'): Fruitless olive trees are perfect for adding interest to any landscape, and since they are fruitless, we can grow them in Arizona and Nevada too! These are medium-sized evergreens that can be used as a focal point in any landscape and with nighttime landscape lighting installed, you can highlight the structure of these trees often dubbed as “living sculptures.” Of course, if it’s shade you’re after, rest easy knowing that this Olive tree variety can bring plenty of shade to your landscape! 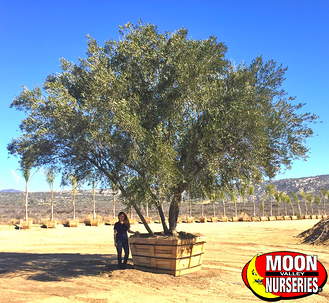 And for our Southern California customers, we have beautiful fruitless and fruiting olive trees available right now! 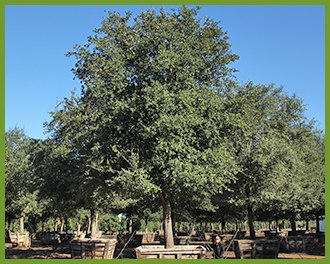 Live Oak (Quercus virginiana): These evergreen trees are native to the Western U.S. and are an excellent choice for landscapes throughout the Southwest! Live Oaks have a long-life span and attract small wildlife too, so if you love the sight of birds, we recommend installing bird feeders and owl boxes. We like to plant them in rows so that they can create a natural privacy screen! These trees are also hardy and able to tolerate extreme drought and windy conditions. Of course, it is also an excellent shade tree and one that is very clean and easy to maintain. This majestic beauty is considered by many to be the best oak for planting. Palm trees are trademarks of the Southwestern landscapes. They have often been seen lining boulevards, in luxury resorts and upscale shopping centers and helping to create a backyard retreat so that you can feel like you are getting away from it all without having to leave the comfort of your home! Can you imagine what our landscape would look like without palm trees? Yea, we couldn’t either! Good thing we don’t have to imagine that because Moon Valley Nurseries custom-grows the best specimens, from hard-to-find-palms to the more common ones! Plant palm trees and enjoy the sunset while it creates an awesome silhouette without blocking too much of your view! Windmill Palm (Trachycarpus fortunei): This small to medium-sized palm brings a tropical appeal to any landscape and is one of the most cold hardy palms you can find! These palms have a neat and small-scale size that makes them an excellent choice for small patios, narrow spaces, gardens, side yards, near swimming pools, or as a standalone specimen. Plant them close together in groups so that you can create one of the lushest hedges you can find. Transform your yard into a resort-style property and enjoy the calming nature of a Windmill Palm. 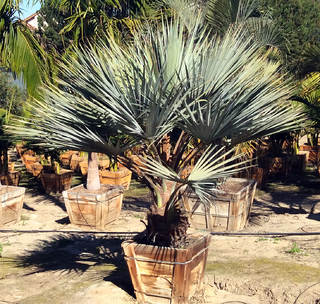 Mexican Blue Palm (Brahea armata): Break up the greenery in your landscape with the stunning Mexican Blue Palm! This harder-to-find palm features dramatic silver-blue fronds all year long and creates flower plumes and golden braids of fruit in early summer that can make it a crowd pleaser in any landscape. We like to use them to create stunning vertical effects, and as one of the most impressive tropical hedges that you can find! If you’re looking for a palm that can add dramatic colors and textural color to yards, look no further than Brahea armata! Yes, You Can Afford a Beautiful New Landscape! It’s true! With easy financing available you can pay over time so that it cannot get any easier to replace the trees and plants the builders chose or create that private backyard retreat you have always dreamed of having! Have you tried our virtual landscape designer app? Give it a try, it’s fun, easy and a great way to visualize your new landscape with our premium quality trees and plants! Of course, you can always visit any of our nurseries and take advantage of our free landscape design consultations too. And with #freeplanting available on all box sized trees, you can relax while our professional planting crew does all the work. Come home to a beautiful new landscape today!